We've been enjoying going to Hollywood Bowl shows this summer again. We've already gone to 5 shows so far and there are still few more to go. For every picnic dinner we bring to Hollywood Bowl, I make onigiri (rice balls). 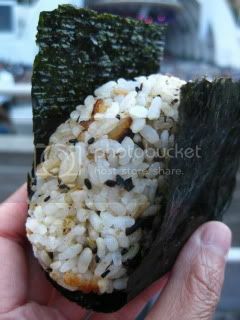 My onigiri is simple but special, because I make brown rice with double-lid donabe rice cooker, "Kamado-san". The rice comes out fluffy and even a few hours after the rice balls are made, the rice still tastes fluffy and tasty. That's the magic of this donabe rice cooker, made of Iga clay. This is usual style (the ingredients for the day was hijiki seaweed, sesame seeeds, and sea salt) wrapped with nori (roasted seaweed). 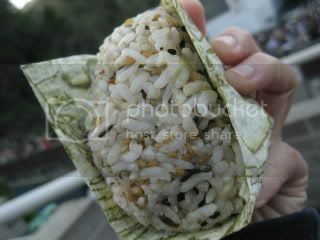 This version is wrapped with thinly-shaved kombu (kelp) sheet. Kombu adds extra umami to onigiri and it also melts in your month. So yummy. Donabe steam-roasted dover sole...in microwave! Japanese Green Tea IPA...very nice brew! Best Hainanese Chicken in America? !